Can you believe Apple’s iOS is 11 iterations old already? It seems like just yesterday we were excited about the prospect of an app store, or the ability to select and copy text. At today’s WWDC keynote, Apple revealed a host of updates and upgrades to iOS, including many long requested features. You’ll have to wait until the Fall to upgrade your iPhone or iPad with the official final version of iOS 11, or in the coming weeks you can weasel your way into an early developer version of the new OS, if you’re brave enough. Do you mostly use Apple Maps to get to the mall? In iOS 11 you’ll be able to keep using that app to find J. Crew, or The Gap, now that Maps is introducing 3D maps to help you navigate your local shopping centers, starting in major cities first, with others to follow, similar to the subway info rollout. The same goes for airports, with indoor maps now available in iOS 11 for major hubs around the world, and more locations to follow later on. If you actually trust your life to Apple Maps while driving, iOS 11 will finally introduce speed limits and lane guidance warnings for easier navigation while on the road. And like with Google Maps, Apple will finally be introducing a one-handed zoom option, although there are no details yet on how that will work. iOS 11 will streamline Control Center, putting all of the options in a single screen including playback and AirPlay controls. It will also include an improved vertical slider design for the brightness and volume controls. The Notification Center and lock screen will also be merged into a single screen under iOS 11, basically requiring users to scroll up or down to jump to notifications, instead of sideways. In addition to visual improvements and more expressive male and female voice options, in iOS 11 Siri is getting improved translation skills, including English to Chinese, Italian, German, French, and Spanish, with more languages enroute. Siri will also attempt to learn, on a per device basis, what a user is interested in, or needs, based on their location, or information they’ve already asked for. iMessage remains one of the best mobile messaging platforms out there (assuming your friends and family all have iPhones) and while a dedicated app store and stickers didn’t quite revolutionize that app, you can now use Apple Pay via a new iMessage app, with TouchID fingerprint authentication, to quickly send payments (encrypted end-to-end) to someone you’re chatting with. Using iCloud, iOS will now ensure your iMessages remain perfectly synced across all of your device. Apple is also continuing to push its stickers feature with a redesigned app drawer that makes them easier to access. But does anyone even still use those? Apple set its sights on Spotify with Apple Music, and while it hasn’t toppled the popular streaming service just yet, under iOS 11 Apple Music will finally let you creep on what your friends are listening to, or you can set all that to private if you’re ashamed of your Hanson obsession. (You shouldn’t be.) Apple Music will also have a Shared ‘Up Next’ playlist so your friends can see what’s queued up at a party and make their own contributions to the mix. While not immediately available to users when they upgrade to iOS 11, Apple is introducing a new backend tool for developers called ARKit allowing them to take advantage of an iPhone or iPad’s camera, sensors, gyroscopes, and other hardware to create and improve augmented reality experiences made popular by Pokemon Go, before we all stopped playing it. Borrowing a card from Instagram, the iPhone and iPad’s camera apps will be getting new photography filters under iOS 11, including a long-exposure effect for Live Photos for capturing dreamy, smeary images of things in motion, which should be perfect for waterfall photography enthusiasts. Live Photos can also be trimmed, and users can specify which frame of the short video can be used as for the still image. To help maximize the storage space on your iPhone or iPad which can’t be expanded, in iOS 11 is also introducing a new HEIF compression scheme, shrinking images better than JPEG can, with minimal loss in image quality. The same goes for video, with a new HEVC video codec. And last, but certainly not least, is the fact that animated GIFs will not only finally play in the iOS Photos app (previously they remained static images requiring third party apps to see the animation) and they’ll even get their own ‘Animated’ folder so they’re easier to find. In addition to adding wireless speaker support to Apple’s Home app, HomeKit will introduce AirPlay 2 to control your audio hardware that supports multi-room playback, including the Apple TV, but not Sonos—at least for the time being. It’s hard to make Apple CarPlay exciting, but under iOS 11 using your mobile devices in the car will get a little safer—by not letting you use them. Taking advantage of clever Bluetooth and wi-fi doppler effects to detect when you’re in a moving vehicle, CarPlay will automatically lock down your phone, giving you nothing but a blank screen to stare at. An auto-reply option for Messages will also be available under iOS 11, letting others know you’re not ignoring them, but are busy driving. iOS on the iPad brings some additional improvements that won’t make their way to the iPhone, sadly. This includes the ability to cram even more app icons to the iPad’s dock, which can be accessed at any time, while any other app is open. The new iOS 11 iPad dock will also attempt to guess what apps you might need next, providing a suggestion at the end of the bar. 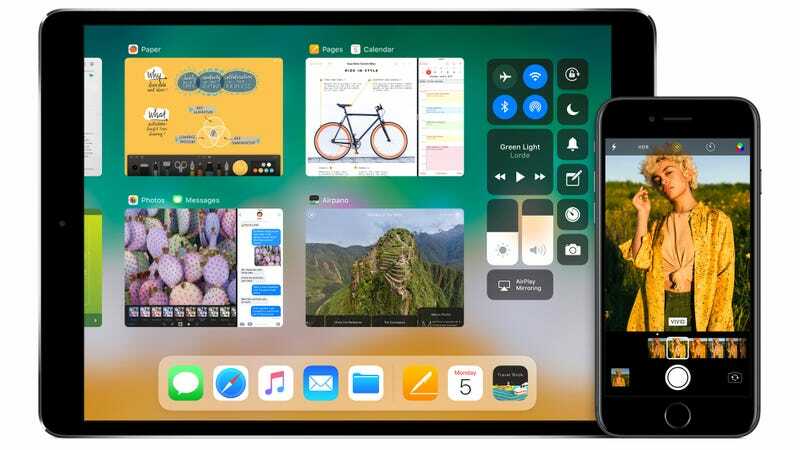 The iPad’s new App Switcher now looks a lot like the one found on OS X, allowing users to drag and drop clipboard contents, images, or other files between open applications in split-view. It would be nice to have on the iPhone, but the limited screen real estate would make things simply too tiny to see when all your apps were tiled across the display. What could be the best improvement made to the iPad’s UI under iOS 11 is the new QuickType functionality that allows punctuation, alternate characters, and even numbers to be accessed from one keyboard by simply using small gestures atop each key. It seems extremely useful, and hopefully Apple will eventually include it on the iPhone’s keyboard. In Notes, iOS 11 will now use machine learning to translate and index hand-written notes so they can be searched, or copied and pasted as editable text. And it will serve as a rudimentary scanner, automatically straightening and converting documents captured using the iPad’s camera. After a decade of updates, Apple is finally giving iOS a dedicated File Manager app called Files—at least on the iPad. But it won’t be as robust as Finder is on OS X, as the iPad’s core file structure will still remain hidden to users. Files seem more useful as a central place to find or delete files when your device runs out of storage space. But Files also has access to stuff you’ve stored on iCloud, and other online storage services including Dropbox, Box, and Google Drive, so you don’t need to hop from app to app to find a document you need.